Have you ever made your own paint before? What about having to mine it in order to make it? Santorinians created their fresco paints out of the minerals that their island withheld, and the results of those frescoes are quite a sight to be seen. Because of these minerals, past Akroteri artists of Santorini have had the opportunity to make some of the finest, most beautiful, and appreciated frescoes and pottery on the island that are still preserved to this day. The minerals that the Ancient Minoans used for their paints composed beautiful colors, and it is all a result of Santorini’s abundant geological resource of minerals. Without the discovery of these minerals, such incredible art would not have been created, and many vital characteristics about the island would not have been disclosed. 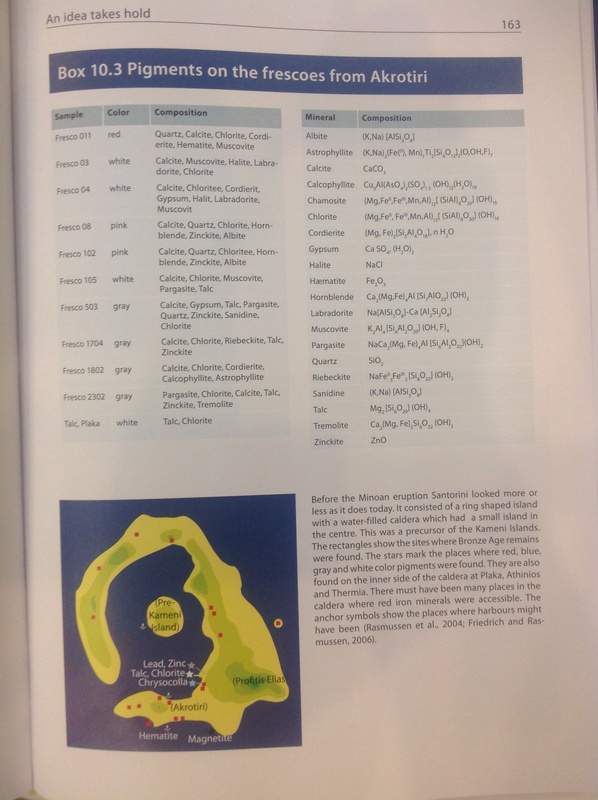 Thanks for such an interesting blog post on the importance of the minerals found in Santorini. The top image provides a great illustration of how important minerals were in preserving the history of Santorini. Your introductory paragraph provides a very nice outlook on the rest of your entry. I am wondering whether you can go more in-depth in your entry on “the finest, most beautiful, and appreciated frescoes and pottery on the island that are still preserved to this day.” I’d like to know more about why the frescos and pottery were preserved so beautifully? Is it the density of the minerals used to make the frescos? More information on this would help me to see the importance of craftsmanship, minerals used, climate issues, and so on. Also, do you know the name of the archeologist who reported about talc? And why was this important for archeologists? Is it important for geologists as well? I am also curious to learn more about the minerals, and why the different minerals show that the area was volcanic. What is it about the geologic composition that allows us to draw those conclusions? In your conclusion, you point out that if the minerals weren’t discovered, we wouldn’t have such beautiful art. Can you tell me when they were discovered? When were the frescos created? When was the pottery made? Thanks for an interesting read. I look forward to seeing some more detail to answer my questions. I appreciate you taking the time to comment and leave suggestions for my post. 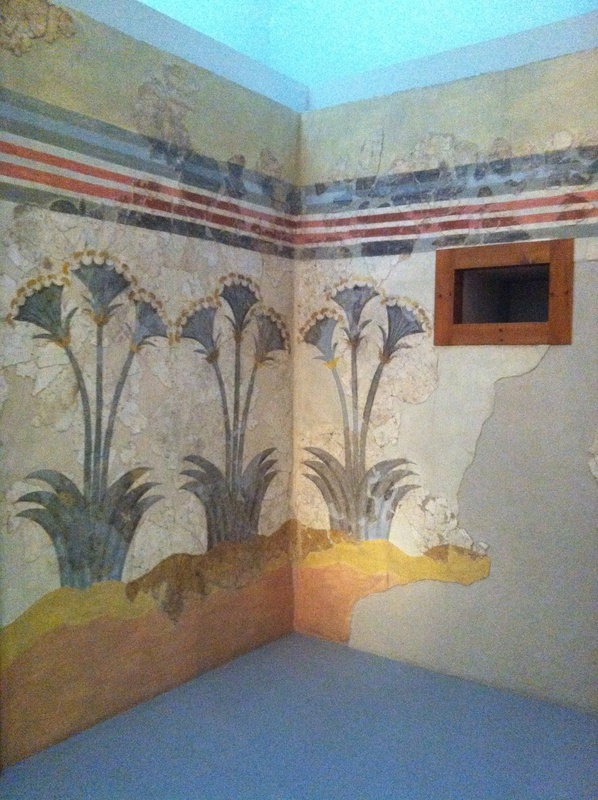 The frescoes and pottery were preserved by the pumice fall of the first phase of the Minoan eruption. For more scientific information about how pumice preserves, please visit Michelle Barton’s most recent post, Akrotiri: A City Frozen in Time. I do not have any information on who the archaeologist was who reported about the talc. The textbook merely said “an archaeologist,” no one specified. The discovery of that talc at the time was important to archaeologists and geologists because they originally thought that the talc was imported to the Minoans. In actuality, the talc was quite abundant on the island, and it was found near the volcanic setting. Hence, also leading them to discover that the island was volcanic. The geologic composition of the minerals lead to the discovery of the island actually being a volcano because that’s how certain minerals are created. With the right temperature, time, and pressure, minerals can be formed within volcanic rock. I couldn’t tell you when the frescoes or the pottery were made, but I know that it was before the Minoan eruption, which occurred in 1613 plus or minus 13 BC. I’m sorry that I’m not able to answer your questions in complete detail. The textbook does not get very detailed with certain topics, such as this one. It was also difficult to find scientific articles that discuss this topic. Nice post Carly! When Conner and I were walking through the Acropolis Museum we found a display about the minerals used in ancient Greek painting and it was awesome to see geology used artistically. But alas no pictures were allowed or else I’d share them with you. I’m happy you decided to delve deeper so that we have more information about what they used. It was especially cool for you to mention where on the island they found those minerals! I love how your post explored the connection between art and science. This was really interesting read–thanks for the post, Carly! Previous Previous post: Why go to Santorini? Next Next post: Akrotiri; Doomed for Destruction, but When?